You wouldn’t dream of eating the tiny beads found in your face wash, right? Well, even if that’s the case, if you like seafood there’s a possibility you’ll be digesting that microbead at some point. A new report [PDF] from the New York Environmental Protection Bureau outlines just how the 19 tons of microbeads dumped into New York waterways each year impact the environment – and consumers’ stomachs. The report is the latest effort by officials in New York to propel the Microbead-Free Waters Act, which would ban the tiny beads from personal hygiene products sold in the state. The Act, first introduced in February, would be the first of its kind in the United States. 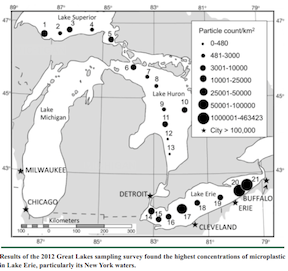 A 2012 survey of New York’s Great Lakes revealed that some of the highest concentrations of microplastics were prevalent in the water. Researchers used a mesh collector to gather 21 samples from the water. It was then determined that Lake Erie accounted for the vast majority of plastic collected with nearly 1 million particles present. While wastewater treatment plants are instrumental in keeping waters in New York clean, the current facilities would need major overhauls in order to remove microbeads. To make those changes taxpayers would have to foot the bill. And so, officials say the Microbead-Free Waters Act is the most cost-effective approach to eliminating the toxins from waterways. Since announcing the Act earlier this year, several major manufacturers, such as Proctor & Gamble, Unilever and Colgate-Palmolive, have pledged to phase out use of plastic microbeads.